Damn, and me without an account. I was the guilty party that shared the link with Mort a few days back, so for the benefit of Greyhawkery readers, here's a direct link to the file. The author of the piece set it as "free" on scribd, and anyone with even a free trial account there can grab it, so I'll leave it up on my google drive for a few days, unless the author requests I remove it. Enjoy. This looks very interesting, I cannot wait to take a deeper look at it. On a quick look, it seems to be almost a clone of the glossagraphy. Has anyone noticed deeper differences? Besides some references to their homemade town of Obsidian Bay and some obscure festivals, no there is hardly a difference from any Folio/Boxed set information. The races may be expanded upon some but I don't see any glaring changes otherwise. The races section is indeed expanded quite a bit from the original Glossography, incorporating later GH material and covering the subraces featured in 5e core. The majority of the art used is from later GH product or other TSR/WOTC product altogether. The rest of the changes seem to focus on combining some of the material from the Glossography and Guide, updating some things to reflect later GH lore, and adding bits like Cleric Domains (which are called "spheres" in the document, for some reason, but match the names of 5e domains in the PHB). The author also added a TON of deities from later GH material that were not in the original box set, especially the demi-human, Olman and Touv deities. NPC Class/Level (for rulers of nations in particular) are listed in 5e format; ie. rogue or wizard instead of thief or magic user. I think the document is best suited to giving to 5e players that are totally new to GH. There's enough detail to prevent having to loan out copies of multiple books, or letting the players browse the LGG, which has a lot of NPC stats and DM secrets/plot hooks stuff you might want to keep to yourself. Of course, the political map in the back is very simplistic, so a better map is the only other thing you might want to provide new players, but I'm sure ya'll can find something suitable in your files, or peruse CF or Anna's site for whatever you need. For the record, my comparison is entirely from memory of the 83 box manuals, which I know quite well, but don't have readily available at the moment. Since I've been running and fiddling with 5e lately, I turned coat and brought my OLD (mid 90s, during a hiatus from the hawk) FR campaign. There are a few scraps of versioned game material here. It's all from 1st Edition AD&D. Not too surprising as that is also the source of most of the text and about half of the art. The holiday descriptions are new and probably came from the Obsidian Bay Campaign. Racial descriptions from LGG were substituted for those in the Boxed set, accounting for the appearance of the Olman. The table of Rulers somewhat bizarrely kept the 1st Ed CY 576 Names, but modified levels and class names to reflect those in later editions even though some of those nations were given new rulers in those later editions. The most obvious being the substitution of Rogue for Thief, but there were a few more subtle changes like replacing Querchard the 1st Ed Bard (F7/T8/B9) with Querchard the (some later edition) Brd(Val)15 in Sterich and changing the Frost/Ice/Snow Barbarian Kings from Fighters to Barbarians. The list of Deities is based on the one in the 3e LGG with many additions and weird changes. If you count the Hero-Gods & Quasi-Deities, the Boxed Set had 66, a few more than the LGG, but with some differences in each. This book merges the two and adds every other maybe-deity ever mentioned as a Demigod or Quasi-Deity, and also lists the major Demihuman & Humanoid gods described in various 1st & 2e references. Where did the female (elf?) archer at the bottom of page 8 and the half orc on page 10 come from? I know the sources for every other image. Good eye on the rulers and deities Tom, I didn't look at those close enough. Yeah it's a solid document overall. Not sure about those artworks. One looks like an Elmore illo, maybe Dragonlance? No problem, re: the doc link. Glad folks are finding it useful. I wonder if it's the "other" Chris Perkins whose augmented AD&D/C&C rules have been used at my table, most notably his "3rd edition AD&D." Thank you Zudrak. I guess the name is a huge coincidence. Huge. I came across this same Player's Guide while preparing for my current Greyhawk game. The website where I found it is http://www.adnd3egame.com/gh.htm. It has a link to the same Gaile homebrew that "Chris Perkins" posted on the Scribd page. The website has some interesting stuff for a Greyhawk noob like myself, and shows off the beautiful map work of Anna Meyer. I'm the guy who posted the Greyhawk file (and just happen to share my name with the WotC guy). 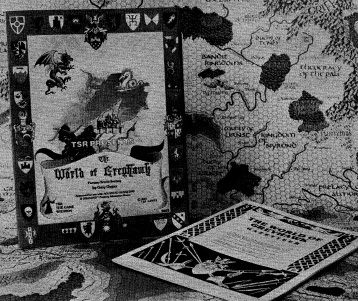 I cobbled the file together from the '83 boxed set, the Greyhawk Gazetteer, and from online sources. Please send any constructive criticism or ideas my way. I'm always tinkering with D&D-related documents, so I'd be happy to add or remove bits in order to give the setting a more classic vibe. Hopefully, some of you have gotten some use out of my site (and the PDF). Just found this—am about to run White Plume Mountain and possibly some of the other 5E updates to classic dungeons found in Yawning Portal. So helpful. Thanks!! Chris: I just now saw your reply on this old blog post. Gotta say kudos, dude. You had me wondering back then. I'm gonna put the link in the post above to update things. Happy gaming and feel free to comment in on Greyhawk anytime.